The alliance will have three core themes – enabling innovation, facilitating new ways of working and partnerships. By facilitating new ways of working the alliance will create additional innovative working practices in an era of rapid technological advancement, multidisciplinary research, high throughput technologies, next generation internet and quantitative and computational approaches to bioscience. Through working in partnership with stakeholders, including key research investors and the private and public sectors, nationally and internationally, the alliance aims to deliver an exciting vision for global impact from bioscience. 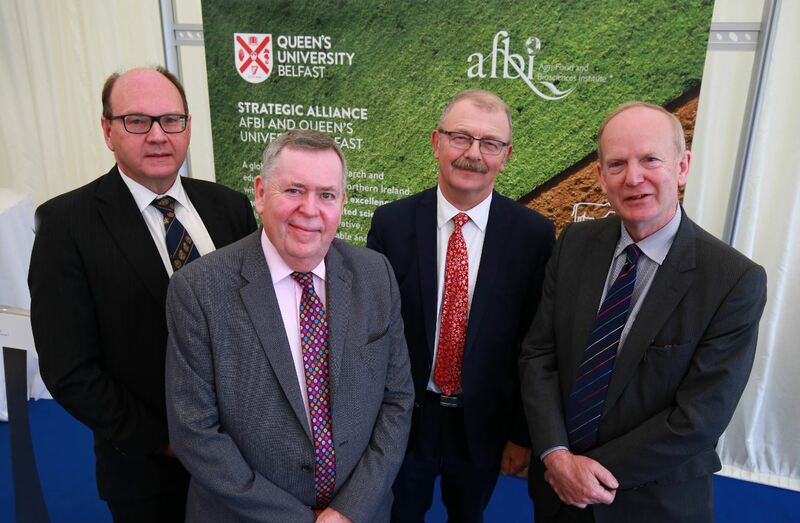 Speaking at the launch event, AFBI Chief Executive Dr Sinclair Mayne, pictured above (right) with (L-R) Professor Nigel Scollan, Queen's Institute for Global Food Security (IGFS), Colm McKenna, Chairman of the AFBI board and Professor James McElnay, Acting President and Vice-Chancellor of Queen's, said: “The agri-food industry is set to experience a period of unprecedented change in the next decade given the major global challenges of increased food demand, climate change and pressure on land use, coupled with continued volatility and uncertainty in agricultural production and food systems. Commenting on the partnership Professor Nigel Scollan, IGFS Director at Queen’s, said: “At a time when the world’s population is growing at its fastest ever rate, food security is a major global challenge. “Responsive, high quality research, education and partnership is essential to ensure the agri-food sector remains innovative, sustainable and globally competitive. Professor Scollan added: “Through the alliance we will focus on tackling the challenges in agriculture and food security, training the next generation of leaders and experts who are equipped with the knowledge and skills required to transform our current food production systems. Media inquiries to Communications Office, Queen’s University, telephone: +44 (0)28 9097 3091 and to Corporate Communications Office, Agri-Food and Biosciences Institute, telephone: +44 (0)28 9025 5636.